Much has been made about Mitt Romney’s comments regarding the 47% of Americans he considers the entitled, dependent, irresponsible poor. These individuals have the audacity, in his mind, to consider the government as having a responsibility to ensure healthcare, food, and housing. And, much of the media in the States has jumped to his defence, saying that the language was wrong but the sentiment right. Of course I am concerned regarding the sentiments expressed, the crassness of the perspective, and the implications for people such as seniors living on a pension. But more so I am dismayed by the deeper underlying philosophy, one I see reflected around me in small decisions like decreasing public transit hours. To me, we are witnessing the slow dismantling of social cohesion. 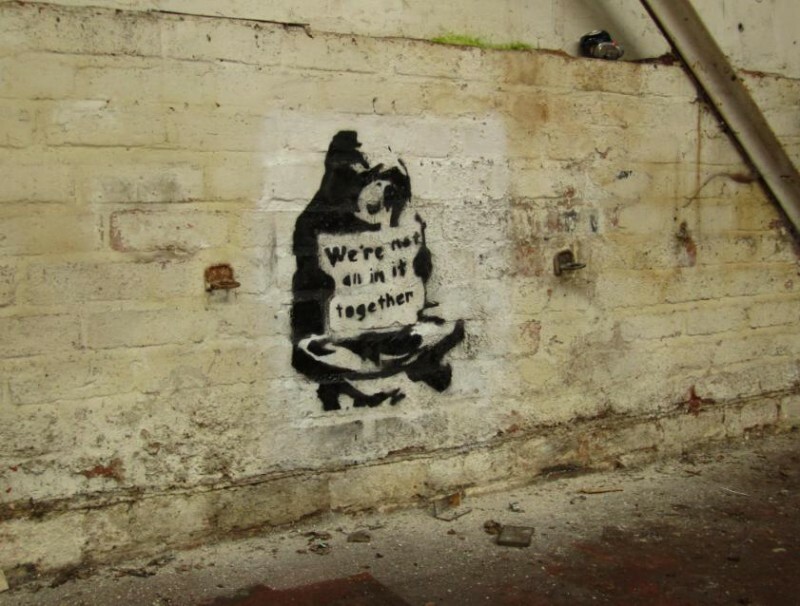 Societies are built on the idea that we are all in this together. For example, in the same way that confederation included means to distribute income equitably between provinces, our legislation contains means to distribute income between individuals. Similarly, rather than being islands unto ourselves, we pay into our governments to pool our resources to fund our services. This is a contract we reaffirm every day with each other by driving on a road or turning on a light switch. Romney’s math is wrong. Because we are, in fact, all of us reliant on our government and on each other. We all use water, roads, healthcare, internationally traded resources, police services, currency, etc., etc. We all access government funds through different programs and services, some simply use a little more, and some a little less. This is the final post in the series, which you can read in full by downloading the pdf version if you like. When it comes to planning decisions, politicians hold ultimate sway. Although the Planning Act and the Official Plan provide some policy, and the OMB serves as a court to settle disputes, there is leeway to be had in changing zoning, and land use designations with enough votes. From smaller issues like the number of trees on a site, to big issues like doubling the size of a tower or shifting from low density to medium, political support has direct financial implications. These financial implications are not just for the developer, but also for the skilled labourers, trades people, and engineers, where a significant lull in work impacts directly on well paid Londoners. There is a lot of money at stake, and there is a lot of power at City Hall. This is why intensification rates, official plans, development charges, and incentives are very important. They set the direction for some of the biggest flow of money within our community. For example, as alluded to in this post, development charges are currently paid by taxpayers for residential development in the downtown core and Old East Village. Although this initially had little effect in the 1990’s, it has been a part of the picture of the doubling of the number of people who live in the core since the City also began investing heavily in the area. This is very healthy for our City and a direction I strongly support. As I have learned through affordable housing, if we are going to rely on the private sector to meet our planned targets, then the right incentives need to be in place. 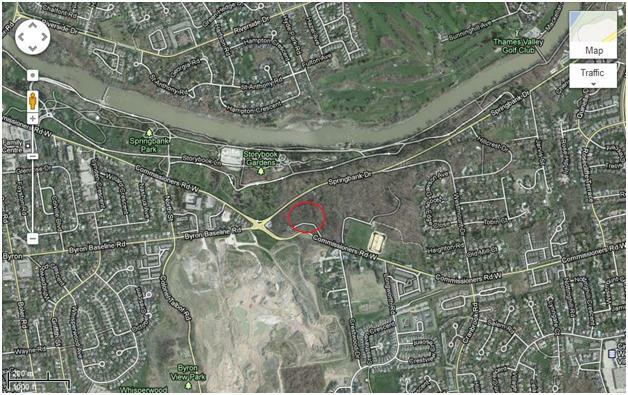 Another example of this would be brownfield development. Brownfield development is a goal of any community, but it is also very often a money pit (unless you’re talking communities like Toronto with massive value per square foot). This means that it won’t happen unless a) the City does it ourselves, or b) the incentives are there to make it profitable for the private sector. So there is a lot of money at play, and a lot of politics involved, which frequently leads to the discussion of campaign donations. The development industry is the largest donor to municipal political campaigns. 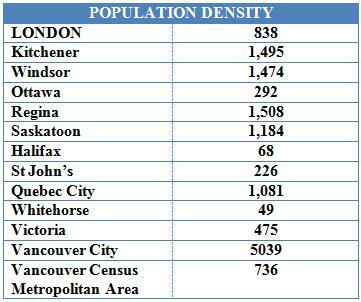 And this isn’t just a London phenomenon, it holds true across municipalities in Ontario. I would not insult any Councillor to suggest that the maximum allowable contribution of $750 would sway a vote, because I don’t think it would. But developers, like any interest group, are no fools and they donate for a reason, if only to open a relationship or create a positive environment for development. When city staff recommend a refusal of a developer’s planning request, it still needs to be voted on by Council, and the stakes can be high. When the Official Plan is reviewed, and the urban growth boundary is part of the discussion, the stakes are enormous. Research by Robert MacDermid from York University has uncovered the important role that the development industry plays in campaign financing. This obvious link between finances and politics brings out the most cynical side of many. Particularly in cases where those in the community who choose to speak out are overwhelmingly opposed to a particular component of an application, yet the Councillor votes for the development. Cynicism can cause the loss of objectivity, evolving into stereotyping of an entire industry. This, I fear, leads to a lowering of the whole conversation. Ill-will builds between community members and the businesses that develop their communities. Instead, I would hope that relationships can be built to foster understanding. Where understanding exists, people can respectfully disagree with each other, or can agree on some pieces of an application but disagree on others. My ultimate goal in writing this series is to try to improve the process of developing London from all sides. I hope that respect can be shown towards developers from community members, vice versa. The best outcomes for our city will come from all of us working together. I have heard it stated that all of this conflict could be avoided if developers simply stuck to the Official Plan. Although I understand where this sentiment is coming from, this isn’t particularly true as although disagreement can arise around designation or zoning, it can also arise around site planning. As I mentioned in my first post, disagreement with a particular proposal isn’t anti-development, it is specific and varied with the proposal in question. More importantly, though, is that although the Official Plan sets the vision for development, we need to be responsive to and predictive of change. This is demonstrated in that of the hundreds of Official Plan amendments done to date, many are done by the City itself. To this end, I will use the site owned by York Developments at Southdale and White Oaks Rds as an example of a good change to designation. This example may surprise you, I because spoke publicly about this site, leading some to think I was opposed to the development. 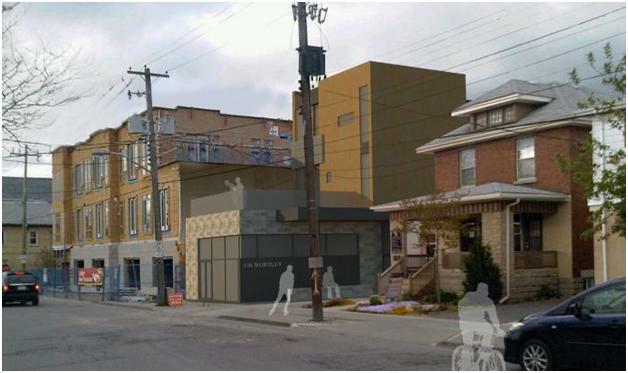 However, this perspective again misses the nuance of community public input on proposals. I was primarily concerned that staff missed the due process of circulating the correct notice to the public. 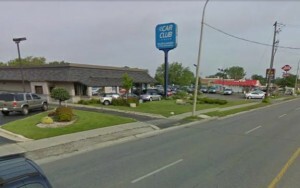 As well, in terms of the site itself, I was in favour of the change from residential to neighbourhood commercial node, but was not in favour of a special designation to include a used car lot in the back corner. 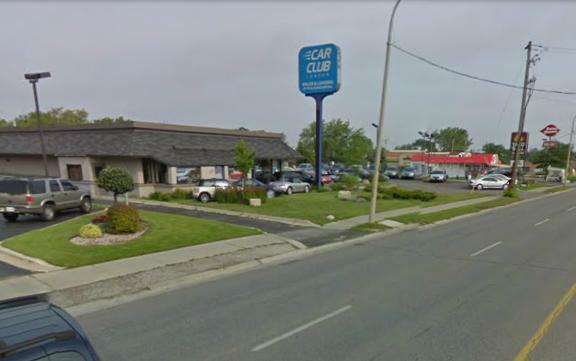 As noted by staff, there are very different parking and site needs for a commercial strip mall, and a used car lot. The site in question is a busy corner that had some rather neglected residential and an abandoned church. To the south of the corner, major residential development has been proceeding over the past five years. York was interested in purchasing a number of contiguous properties, and building out the whole corner as a commercial node. In my opinion, this makes good sense. The residents of the new neighbourhoods will have an interest in easily accessible commercial, and the exposure and high traffic at the corner means that proposed drive-thru restaurants would likely do quite well. In this case, to simply hold to the existing designation would mean missing an opportunity to both catch up with the ongoing evolution of the area, and set a renewed vision for the corner. In my final post, I will get into the really messy area of development, the politics. Most of you will be aware of the buzz around methadone clinics over the past two years. For a period of around 18 months we have been in the process in London of creating a by-law to manage methadone clinics and pharmacies. With the by-law now completed and being law, the first organization is applying to open a new clinic. One of the components of the new by-law is a public participation meeting around site planning. When the by-law was being developed I expressed some concern around this stipulation, as I wondered whether it might just bring out the worst in terms of NIMBYism. Sure enough, comments on this and this article in the London Free Press confirm my concerns. An important first place to start with the methadone discussion is a reminder that methadone is a treatment modality for addiction. Many decry methadone stating instead that we should be treating the addiction, which shows a degree of confusion. Methadone has been amazing as with no other substances do we have the opportunity of giving people medicine to eliminate addictive cravings, though researchers have certainly tried. Methadone does not get an addict high (though it would someone who has never taken narcotics), so people who work in a factory or operate heavy equipment are able to work when they have taken their dose. For community members concerns, I believe the most important comment in terms of methadone being a treatment is that it alleviates a huge amount of crime. If someone is unemployed and supporting a $150/day addiction, they are likely involved in property crime (ie. theft), prostitution, or drug dealing to support their habit. By giving them a medicine that blocks the cravings this is a huge boon to the community. Imagine the 1300 or so people currently receiving methadone treatment not having that option, and still having their addiction. It is also worth noting that narcotic addiction shows no preference based on class or neighbourhood. The people accessing methadone maintenance treatment are our neighbours, our relatives, our co-workers, and our friends. They want their treatment to be private and accessible. This is quite relevant to the current discussion of the site on Whancliffe Rd (pictured above), as my fellow residents of Old South at times forget that health and social problems exist in our neighbourhood like any other. Which all ties in nicely with the particular concern around this site, that there is already another clinic a few blocks up the street. The first point I would make is that no one knew that other clinic was there until it was publicized, not even myself, who has worked in the sector and drives by it almost every day. We need to recall that the initial purpose of creating the by-law as to ensure that we had a lot of small clinics, instead of a couple of large ones. This is exactly what is being proposed. The applicant has done their analysis and found that the market is demanding another site in the area, the current small, quiet one being insufficient. So, a second small, quiet site nearby will meet the demand in a way the least impacts upon the community. 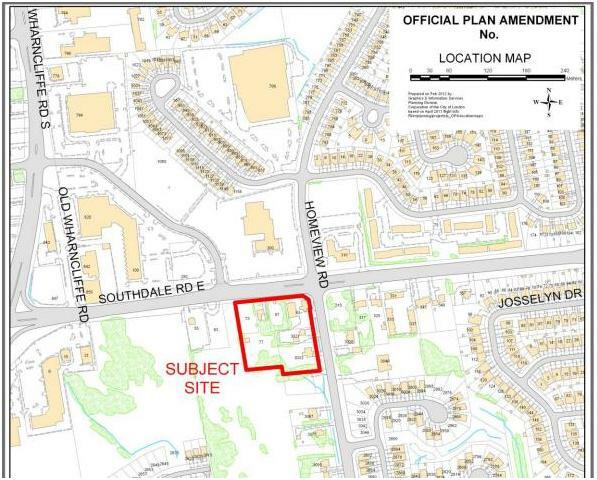 If you would like to have your say on the issue, I invite you to the public participation meeting on Wednesday, September 5th, 2012 from 6:30 to 9:30 p.m. at Hillside Church located at 250 Commissioners Road East (at Wortley Road). More details are available on the OSCO website. These meetings are all about making our democracy participatory, so are a great experience and I would encourage you to both come out and speak out. In this post I would like to explore the Reservoir Hill site as an example where a strong business case can be made for a designation change, but a strong community case can be made against it. I don’t want to get into the details of the whole process as it has been thoroughly covered by other bloggers including Phil, Gina, and Brian. Also, the process is now completed, and things will move on. In a nutshell, the lot was designated open space, went for sale and was declined by the City (and declined again in 2000), was purchased by a developer in 1967, was changed to multi-family high density residential after going to the OMB in 2001 (plus appeals, etc.) and with the OMB becoming the approval authority will now be developed. 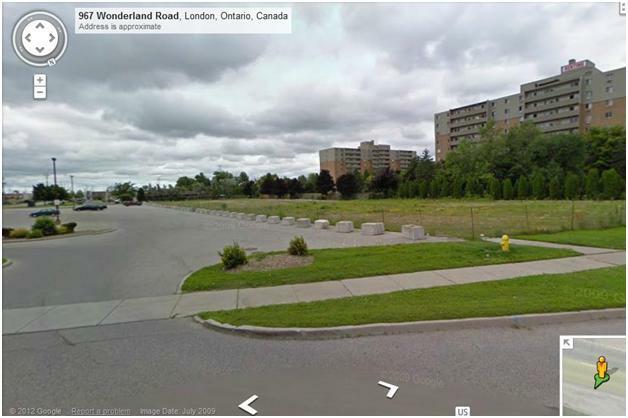 As noted in the OMB decision, this will be a lovely site for an apartment building, with adjacent parks, and much of the property remaining open space. The business case is obvious, units will be priced at the high end of the market, and will likely reach 100% occupancy in record time. People will want to live here. Knowing the value of the site and the projected popularity, Ayerswood (the developer) made previous application for three towers. There is no denying that this development will make money flow, including into city coffers through development charges and property taxes. However, there is still strong community opposition to this project, with the primary request being that it stay designated as open space. The City could have bought the land to achieve this end, but it is not reasonable to demand the City purchase every open space, this would not be a good use of tax dollars and is why we have land designations. So, this is perhaps simply a classic case of NIMBYism, community members recognize the need for development, but don’t want it in their backyard. This suggestion is particularly notable in this case as for two of the key opponents, Bill and Anna Hopkins, the development is literally adjacent to their yard. Yet, it was notable to me that currently, and throughout the years, many of the opponents did not have such direct investment in the project. The majority of my friends and relatives are not particularly interested in municipal political issues, so will at times note something in the news and ask me what the issue is about. In driving two friends one day who had asked about this issue, I decided to detour and take them past the site. They were both surprised to discover that the part of the hill in question was not park land, did not think it should be built, and unfortunately for Anna and Bill also thought their house should be demolished and turned back to park. 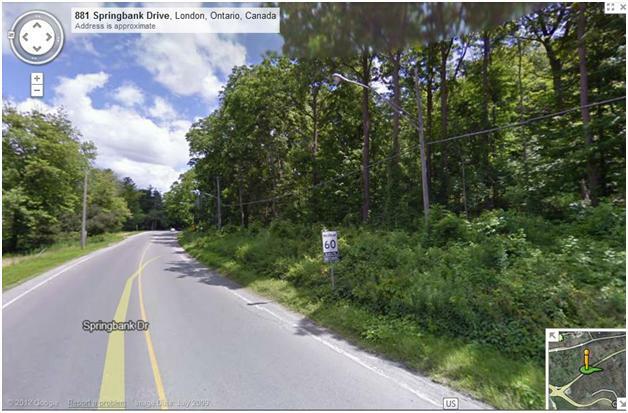 This response of leaving the site a forest has been unanimous amongst (an admittedly non-representative sample of) people who I talk to about the issue, and who I show the site on a map or through Google Streetview (pictured below). 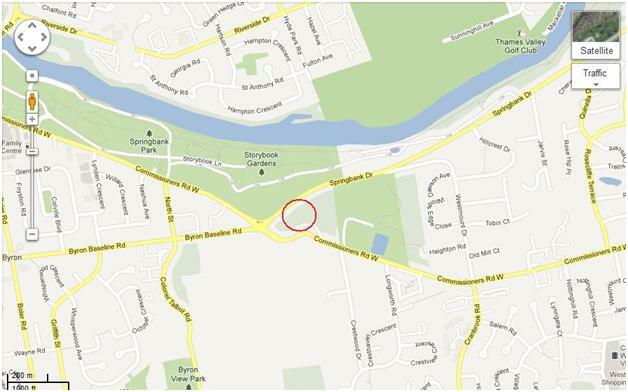 No lines on a map change the fact that this site feels like a part of Springbank Park. With this being our City’s favorite park, I feel fairly confident that a poll of the City would reveal that people do indeed want development, but not on this particular site. There is no shortage of other spaces where people would rather see towers built (see image below). The business case is strong, but so is the community case. It is the developer’s prerogative to ask for a designation change, but in many cases the designation in the Official Plan is representative of the community’s and City’s best interest and thoughtful desire for an area. Market demand does not necessarily parallel the best interests and wishes of the City as a whole. That said, in my next post I will explore changes to designation, and note that as communities evolve over time, many changes to designations make good sense. The reason that we have official plans, area plans, site plans, urban design review, heritage designation, and zoning is that markets alone do not necessarily drive smart development. Removing all of this planning, sometimes simplistically labeled as ‘red tape’, could prove disastrous. Making money and keeping people working is not sufficient to build great cities. The maximization of profits, which is a reflection of good business practices, can lead to decisions that are good in one context, but bad in another. For example, height is an important issue in planning, and high rises should be buffered by medium rise or medium density. A developer who applies for a change from a 4 storey to an 8 storey building might be maximizing profits, but throwing off the plan for the best feel of a neighbourhood. Community opposition to keep the height at 4 storeys isn’t anti-development, it is pro-development in a form that they consider fits best. Similarly, a new subdivision in the far reaches of a city might be very well designed, but can have traffic implications for the neighbourhoods between it and downtown, or it and the highway. The Official Plan and area plans help hold the big picture. Although I would suggest that the best developers will, there is no requirement for businesses to care about the needs and wishes of their neighbours. The idea of the big picture is where both commercial and residential development can go poorly; if city level planning is too vague then the impact of new development on existing spaces can be missed. The Southwest Area Plan and the call to create new, more vague, land use designations allowing up to nearly 3 million square feet of commercial where 800,000 was recommended by a consultant study is a perfect example of this. Developers of new commercial or office may inadvertently beggar their neighbour, as we have seen already with the decline of Westmount Mall in parallel with the growth of outdoor box store malls just down the road. 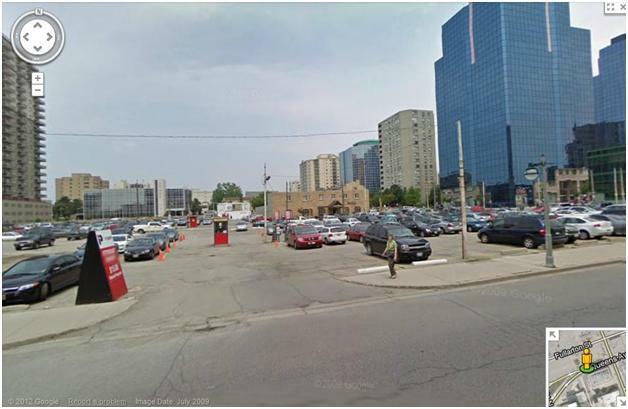 There is no denying that the market demand is for big box outdoor malls, but will the loss of the WhiteRose Plaza (pictured above) and Westmount lead to the redevelopment of something greater, or the loss of walkability for an area with many seniors? Sometimes a series of good business decisions can have negative impacts on the community as a whole, including walkability, traffic, and land utilization. On a small scale, development can go wrong through the site planning process. A good example of this is the Wortley Rd properties (pictured below). Although there was much collaboration between the community and the developer, square footage and siting on the lot were threatened to be contested at the Ontario Municipal Board. Ultimately, I think these two developments are great for the community, will intensify residential and provide more retail, and add some nice flavour to the village. However, in my opinion we could have done better with the set-back. Two feet further back from the curb on the west/front side, with a lesser setback from the east/rear property line, would have made for a better flow with adjacent buildings when approaching from the north or south. These relatively minor details can have a big impact on how the final product fits with what is existing. A final example of the complexities for development is the recent building of garage-fronted houses in the Old South neighbourhood. In one instance it involved the severing of one property into two, and building two single-detached houses. This is a form of intensification, and therefore fits one of the goals of planning. 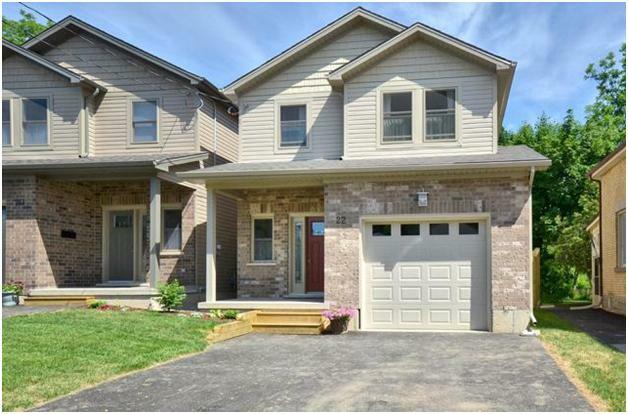 However, with the thin lots, the builder then had to fit the demand for parking and a garage, but had no space to run driveways down the sides of the houses like every other house on the street. This led to the building of garage-fronted houses that although they are the most valuable on the block, don’t fit at all with the neighbourhood, such as on Emery just east of Wharncliffe (pictured below). Again, this is a series of logical business decisions that might ultimately not be the best for the community. The developer was not malicious, the intensification is good, but the era streetscape has been altered. In my next post I will look at the Reservoir Hill development as a particular case of good business with a bad outcome.